"Hodgkin Lymphoma Is Cancer Of The Lymph Nodes"
Hodgkin lymphoma is cancer of the lymph glands, which includes the lymph nodes and the spleen. 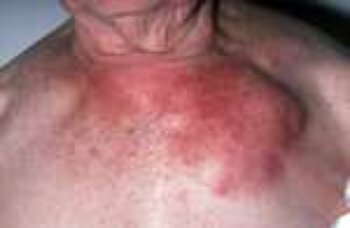 The first sign of the disease is often enlarged lymph nodes. From there it can spread to other nearby lymph nodes. Later it may spread to the lungs, liver or bone marrow. The cause is currently unknown. Hodgkin lymphoma is rare. However it is linked to chronic inflammation . New cases represent less than 1 percent of all cancer cases in the United States. In Hodgkins disease, cells in the lymphatic system become abnormal, but the cancer tends to spread in a fairly orderly way from one group of lymph nodes to the next. Eventually, It Can Spread Almost Anywhere. Hodgkin lymphoma accounts for about 14% of cancers that develop in lymphatic tissue.All other types of lymph cancer such as follicular lymphoma are called non hodgkin lymphomas . Hodgkin Lymphoma Is One Of The Most Curable Forms Of Cancer . Malignant Lymphoma is the third most common cancer among children. It is most likely to be diagnosed in people in their twenties or thirties. It is less common in middle age and becomes more common again after age 60. Doctors will diagnose Hodgkins lymphoma with a biopsy. This involves removing and examining a piece of tissue under a microscope. Treatment will depend on how far the disease has spread and often includes radiation therapy or chemotherapy. A Link Between Chronic Inflammation And Cancer Has Been Known For Well Over A Century. The longer the inflammation persists, the higher the risk of associated cancer . Researchers Now Say Chronic Inflammation May Be A Causative Factor In A Variety Of Cancers. Acute inflammation, such as occurs in response to an infection, or an injury is not regarded as a risk factor for the development of cancer. The response of the body to a cancer has many parallels with inflammation and wound healing. If you are experiencing symptoms of lymphoma, you should see your health care provider as soon as possible. If the lymph nodes don't feel normal,they will do a blood test and a chest xray. You may also have a biopsy which is the only sure way to make a diagnosis. Follow An Anti Inflammation Diet , This Is Also A Heart Healthy Diet! offers significant protection against Hodgkin lymphoma. Consumption of omega 3 or marine fatty acids was associated with decreased risk of Hodgkin lymphoma AND chronic lymphocytic lymphoma. You will have to keep a food diary for awhile, until you find out if any of the above is a factor. Your doctor may want to test for food sensitivities. Eat fewer red meats and more lean meats, or beans for protein. Avoid These Oils: They All Cause Inflammation! Drink 6 - 8 glasses of water daily. Exercise lightly, if possible, 5 days a week. Omega 3 Fish Oil, to help decrease inflammation. Fish oils may increase bleeding if you are taking blood thinning medications. Talk with your doctor. AT THE BEACH: Moderate Sun Exposure Shown To Reduce The Risk Of Malignant Lymphoma. There has been a lot of information out lately about vitamin D. It seems most of us are deficient. I have read several articles that say vitamin D will protect you from the seasonal flu and also the H1N1 strain that we are being warned about. It might be something to consider taking. Especially if you are like me and live in a northern climate where we don't get any sun exposure all winter. Fortunately survival rates for Stage I and II non Hodgkins lymphoma and Hodgkins lymphoma are very high. Patients treated for Hodgkin lymphoma with radiation therapy have a substantially higher risk of stroke , according to a new study published June 17 on line in the Journal of the National Cancer Institute. This is another reason to Follow an anti inflammation diet . Hodgkin's sometimes develops into non Hodgkin lymphoma.Radiation and chemotherapy can cause secondary cancers.